This compact little organizer is the perfect storage solution for smaller spaces. 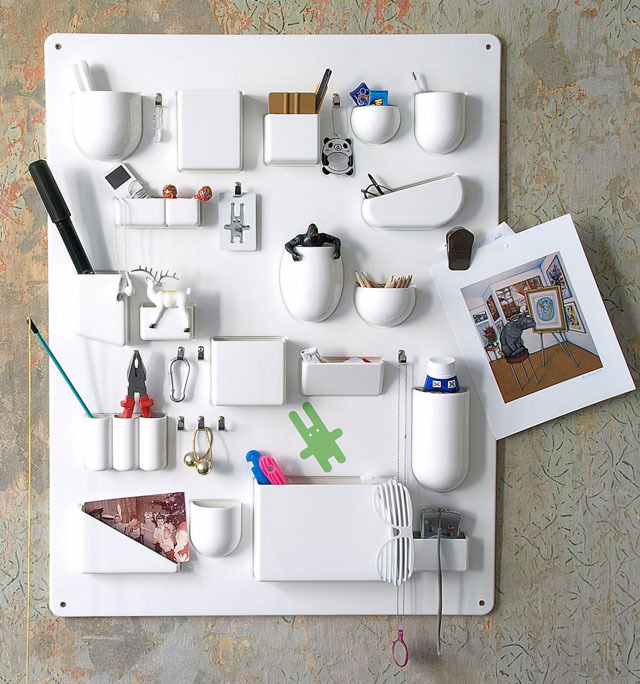 If a cluttered workspace drives you up the wall, you will absolutely love the Utensilo Wall Organizer. 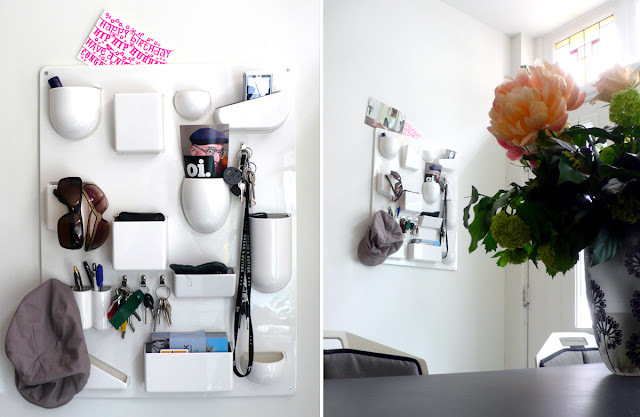 Now you can use your empty wall as a storage space! The Utensilo is a super functional wall-mounted storage tool and organizing solution for your home office, business, kitchen, garage, classroom and other places where space is at a premium. 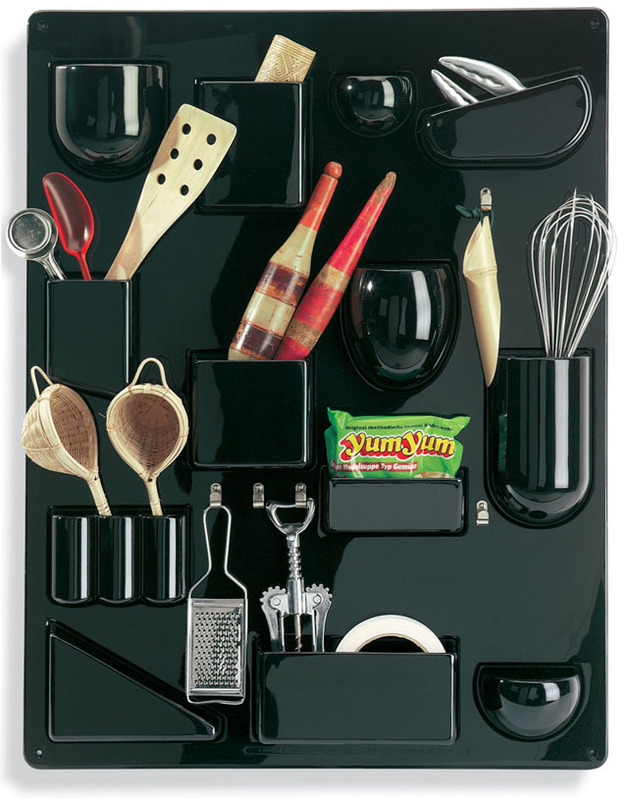 The Utensilo wall organizer eliminates clutter and helps you keep tabs on your most essential items. It has five hang-it-all hooks which can be used for keys, rubber bands, etc. And it has 14 convenient storage compartments which are perfect to organize pens, cards, notes, scissors, brushes, etc. It neatly stores any of your desktop necessities in a clean and organized modern way. 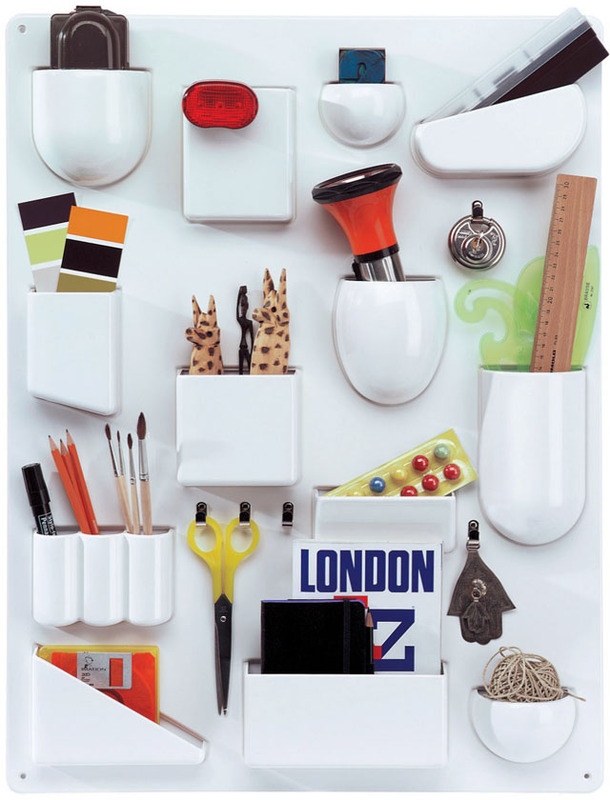 The Utensilo wall organizer is a highly functional storage solution and icon of mid century modern design. An organizer that you will use every day! Use it in your office, living room, kitchen or garage...and everyone will know you are a real cool cat! By far the coolest organizing tool that we have ever seen. The Utensilo wall organizer easily attaches to a wall with four screws. Uten.Silo was designed in 1969 by German designer Dorothee Becker. You'll never struggle to find anything in that office or kitchen junk drawer again when you sort it all on the outside for easy accessibility. Though quite a splurge, this retro plastic piece brings instant organization to any area that could use some tidying up. Available in three colors and two sizes. Whether by the front door, in the kitchen, or beside your desk, use your wall space to corral your belongings. This relaxed wall-mounted storage solution system organizes your home office and household’s busy schedule. The multi pocketed wall organizer makes the perfect wall storage for the office, home, kitchen, entryway and adds a nice decorative touch, too. With its different-sized and shaped containers, its metal hooks and clips, Uten.Silo (AKA Utensilo Wall Organizer) organizes offices, kitchens, workshops, bathrooms and children's rooms. Vitra Design Museum produces both the original 1969 version of Uten.Silo and a smaller one dating from 1970. Utensilo is one of the best-known plastic designs of the late 1960s. Today, this colorful wall tidy is a veritable design icon and a true-to-the-original version of the product has now been reissued by Vitra Design Museum. At the end of the 1960s plastic was on its way to becoming one of the dominant design materials. In Italy, designers such as Joe Colombo and Vico Magistretti designed bright and cheerful furniture, luminaires and consumer goods for innovative manufacturers such as Artemide and Kartell. With the Bofinger Chair and the Panton Chair, the first seats made entirely of plastic appeared. At the same time in Munich Ingo Maurer, who had already attracted attention with his "Bulb" luminaire, launched a plastic wall tidy which created quite a stir. Image Credits: MODERNDESIGN.org, NOVA68.com, Rock That Horse.